When Audi shared its F12 e performance R8-based prototype with us, the point was to show off the company's burgeoning prowess in components such as batteries and drive systems for electric mobility. All very impressive and not to be discounted, it was the F12's use of the Apple iPad that stole a bit of the limelight during the presentation. As an experimental display of things to come, the development team behind the Forschungsauto 2012 (a.k.a. ‘F12') in conjunction with the Audi Electronics Venture GmbH (AEV) found various highly creative ways to implement a tablet and centered their development for this application on the Apple iPad. In this particular application, a custom interface docks the iPad squarely in the dashboard of the R8, where you'd otherwise find the car's normal navigation system and audio controls. Completely integrated with a large horizontal screen that replaces the Audi R8's main instrument cluster, the programming on the iPad allows the driver to switch from Sport to Comfort and Eco efficiency modes that also change the mood lighting on both displays – red for Sport, blue for Comfort and of course green for Eco. Exit to the menu of the R8 F12's operating system on the iPad and you'll find other typical functionality you might otherwise expect on a mobile tablet device – things such as calendar, contacts, video and music. Car-specific functions are also controlled here – things like climate control, audio play controls, car settings and information, as well as data about the car's battery. But, what if this electrically-driven R8 were your car and you lost the iPad? Would you be stranded? 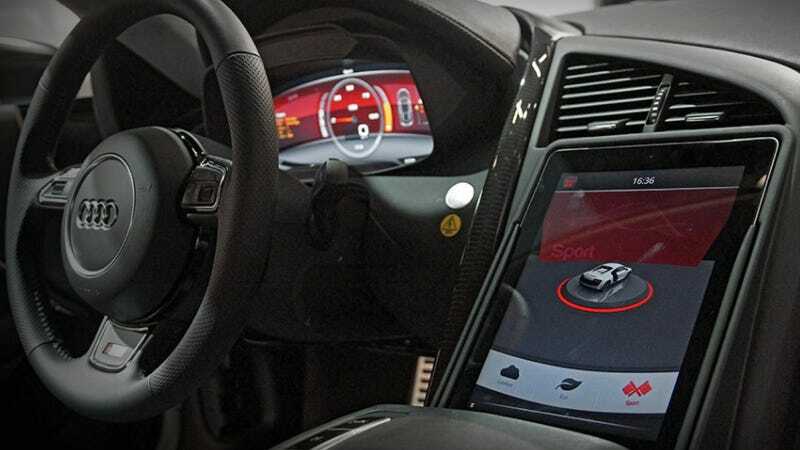 Engineers on the F12 development team shared that the car could be piloted without the tablet installed. Basic driver comfort functionality is designed with redundancy and the tablet's presence for those functions is unnecessary, though the driver experience is no doubt much more impressive with the iPad in place. Since iPod integration is virtually ubiquitous within the car industry, it seems pretty obvious that iPads have already made their way into the average automobile as a storage device for music at the very least. Still, what Audi engineers have done in the case of the R8 F12 e Performance prototype goes way beyond that. The idea of using an iPad to operate virtually all driver interface functions on the car is a radically different philosophy. Envisioning this type of setup in a real world brings forth infinite possibilities. Such a setup would allow for considerable customization and tailoring to the owner's preferences. Updated technology seems even more readily implemented than Audi's about-to-be-introduced modular media architecture that raised eyebrows on introduction at last year's Consumer Electronics Show in Las Vegas. Could this be the next step? In addition to the cabin-mounted iPad that seems quite capable of replacing Audi's own MMI interface, Audi presenters were also using Apple's wunder tablet in the presentation of the F12. Seemingly with virtual X-ray vision, Audi staff were able to hold the iPad's camera up to view the car and on screen, CAD-derived overlays of the car's drivetrain and battery technology could be clearly seen. In case it is not obvious, the iPad's camera was reading data off of the Audi R8 F12 itself. Vinyl decals on the hood and on each door looked like a complex pattern that meant nothing when viewed by the naked eye, but translated the positioning of the car's experimental components when viewed by the iPad's built-in camera. Depending on the angle from which the tablet viewed the pattern on the car's body panels, it then displayed CAD renders on top of the image of the car. Walk along the length of the car and the angle on the renders change with you, making it look like components were actually sitting at a fixed position within the car. The net effect was very cool for the common viewer. More important in presenting a futuristic electric drive component system as was intended by the R8 F12 e Sport prototype, this allowed the project development team to easily share their creations most effectively to Audi executives, students at participating universities or whomever else they may wish. This story originally appeared on INR8 on November 9, 2012 and was republished with permission.